The 6 x 6 Multi Store Apex Shiplap Wooden Shed has one of the most unique designs that you will ever see. It really does not look like any other shed that is out there right now. The main reason for this is the separate storage sections. This shed has not one, but five different areas for storage. On the front you have the two main, larger areas. On the side there are two slimmer, but tall storage areas and there is also a good sized horizontal storage area on the side as well. This gives you many different ways to organise your belongings. Each of the different storage sections have their very own door with a rim lock so anything you place in here is going to be kept very safe. This is actually a very solid shed. The cladding they have used is 12 mm thick tongue and groove shiplap cladding which is strong and will not allow water inside. Connected to the solid cladding is the frame. This is not your usual frame as it is a very impressive 45 mm x 45 mm. 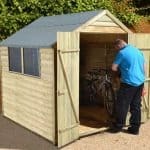 This is one very secure shed and it is perfect if you want to keep your belongings somewhere that offers a lot of security. 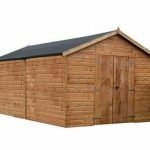 The 6 x 6 Multi Store Apex Shiplap Wooden Shed is one of the most uniquely designed sheds that we have ever seen here at WhatShed. We honestly cannot think of another shed that has a design like this. 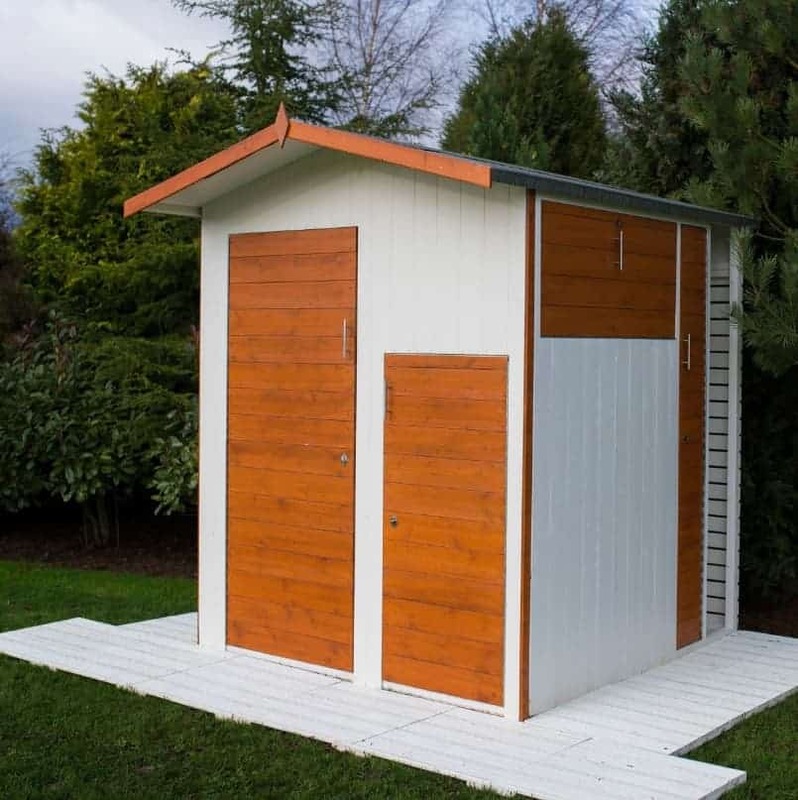 Rather than just having one large storage area, this shed actually has five storage areas, each with their own door! It sounds weird and more like a kids playhouse, but it actually works well and you could have each compartment for a different purpose. One could be for tools, one for bikes, one for outdoor toys, and so on. The largest section of the shed is 2 feet 2 inches wide and a little over 3 feet deep. There is also 5 feet 5 inches of headroom here. Next to this is a smaller 1 foot 11 inches wide section which is the same 3 feet deep as the larger section. On the side of the shed are three more storage sections. One which is a horizontal area which looks really cool and would be ideal for things like footballs or any other garden toys the kids may have. Towards the back end of the shed are two more sections. The first one is very thin and a little under a foot wide, but its 5 feet of height makes it ideal for thinks like rakes, hoes and other such things. Right at the back is the final section and this is more open to the elements so things that do not need to be kept safe from water will be best kept here. Despite the multiple storage sections, the 6 x 6 Multi Store Apex Shiplap Wooden Shed is kept all under one apex roof. They have not actually said what kind of boarding is used for the roof, but we at the very least we would think it would be solid sheet boarding. One thing we do like about the roof is the rather large overhang that it has. We really like the overall design of this shed and feel that the 12 mm thick tongue and groove shiplap cladding just looks fantastic. We are huge fans of this kind of cladding as it really does keep the rain out better than any other cladding. 12 mm thick at this price is actually very impressive. If you look very closely at the pictures then you will be able to see that there is a nice and thick frame inside of here. The frame is actually 45 mm x 45 mm and that is something that really caught our eye. This is one very solid frame. The frame is clearly made with the idea that this is the kind of shed people will open one of the many different doors and just throw things inside. The shed will have a very robust feel to it and the main reason for this is the frame. Like the roof, the 6 x 6 Multi Store Apex Shiplap Wooden Shed does not actually say exactly what kind of boarding is used for the floor, but if you look closely you can see that it does actually appear to be fully boarded. We really like this as it is that little bit stronger than solid sheet boarding so it will be able to take a lot of weight. While the shed in the picture may have a rather funky and cool look, they have said that this is only dip treated and it is not painted at all. This means that shortly after construction you will have to give it a coating of wood treatment. Coating the shed in wood treatment is something that should be done on an annual basis. You do this simple step and we are sure you will never have an issue with rot. Ugh, why is there no information about the warranty of this shed? Seriously, they give you about four paragraphs of tips about how to install it, but not a single sentence on how long the warranty is. This is very frustrating as it means you will have to enquire about it before you order. But in our experience most sheds of this size, made with these kinds of materials and with a dip treatment like this, tend to come with a ten year anti rot guarantee that requires annual treatment to be valid. 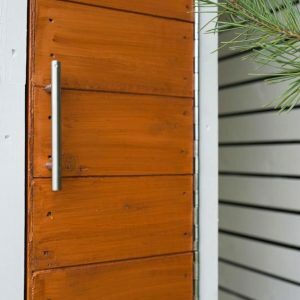 The doors are one of the most interesting aspects of the 6 x 6 Multi Store Apex Shiplap Wooden Shed. There are four doors in total here. On the front of the shed you have two doors, with one being a fairly standard sized single door and the other a shorter one. On the side you have a tall skinny door and then there is a horizontal door, kind of like the ones you find on a bus where you store your luggage. We must admit, we think there is something very cool about the fact that this shed has so many doors. Each door has hidden hinges and a large door handle to make it easy to open them, even when your hands are full. There are no windows at all on this shed, but to be fair, we are not actually sure where they could put any windows on this even if they wanted to. We actually really like the fully boarded look of this shed and feel that windows really would not have worked. Each of the four doors has its own rim lock. This is really great as it means you have a ton of security here. We would think that it is the same key for each of the four doors so you do not have to worry about walking around with a big set of keys like you are a warden at a prison. The hidden hinges each door has also helps add to the overall security. Anything that you put inside of here is going to be hidden away as there are no windows. 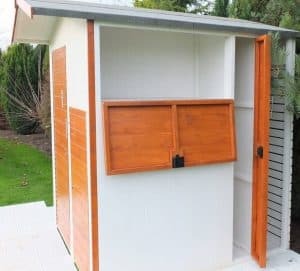 We really like how private this shed is and think that it makes it an even more attractive purchase for those who want to make sure no one can see all of their awesome items. Not one single extra is offered with this shed. To be fair this is not all that bad as it just means you have a little bit more money in your pocket. 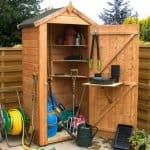 Money you can use to buy new toys, tools and gardening gear to fill this shed up. We are very impressed with how this shed turned out. It is actually very good quality and if they were more open about what the floor and roof were made from, then perhaps we could have scored it a little higher. 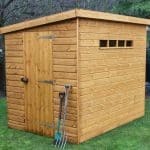 You are going to be able to get many, many years of use out of this shed, but in order to do this, you must remember to give the wood a coating of wood treatment once a year. Ok so the overall size of 6 x 6 may not be all that big, but the fact this is split into different sections makes it much easier to organise your items in a more efficient manner. Usually a 6 x 6 shed is not going to cause you any headaches, but with the extra doors and sections, this one may be a little frustrating in places. Just be sure to take your time and have a good buddy there helping you out. 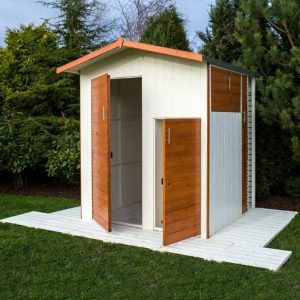 The price may seem a little high for what essentially is a 6 x 6 shed, but we feel the unique style and the overall design do make the price quite reasonable. 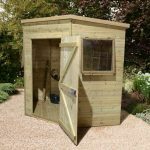 The 6 x 6 Multi Store Apex Shiplap Wooden Shed is a shed that is impossible not to be intrigued by. 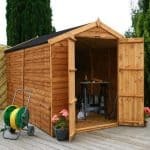 We feel that this is the kind of shed that is ideal for those of you who do not have a ton of storage space in your garden, but also like to keep your belongings well organised. That is exactly what this shed offers. You can have one section for the mower and gardening items, another for tools, and then another for the kids toys and so on. The different sections really do open up a whole host of possibilities when it comes to garden storage. If you want something a little different, then this is a shed that you should take a closer look at.